From night riding under the Aurora Borealis in Alaska to riding around Aurora Michigan, these gloves will keep you warm. Fully insulated 115g Thinsulate™ cold weather glove. 20g Thinsulate™ in palm for easier use of your controls. Hipora® waterproof, windproof, breathable membrane keeps you dry and warm all day. High grade genuine leather palm and finger tips for years of durability. Additional leather strip between thumb and index finger provides reinforcement in high use-area of glove. Extended neoprene cuff eliminates open exposed area between gloves and jacket. Cinch cord cuff may be tightened around jacket sleeve for additional protection from the elements. Wrist strap offers additional adjustment to ensure a custom fit. Reflective safety piping offers added visibility in all riding conditions. Bold design bundled with all these features help make this one of Fly’s most technical cold weather gloves. Great glove for all of your cold weather outdoor adventures. I needed gloves for my winter commutes. With heated grips on high and hand guards with wind deflectors 35 deg weather was no problem. I don’t ride in the rain at least not on purpose so I can’t comment on the water proofing. I have pretty big hands and ordered the XXlarge. They fit well. These gloves are a little tough to get on due to the neoprene liner but thats what makes them warm. I just fold back the cuff and slip them on. Ive riden down to 45 degrees and they seem to keep my hands pretty warm. I have barkbusters on the bike though so that helps. These gloves have decent protection and they are comfy. Definitely a great bang for your buck winter glove. 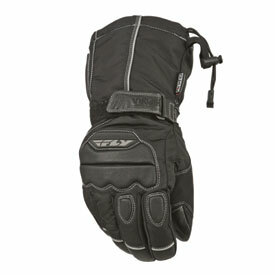 I imagine with heated grips these gloves could allow you to ride in almost freezing temps. But who wants to do that? I first bought size L, but they were way too small so I exchanged for XL. They still were smaller than I liked, but not bad enough to return. They weren't as warm as I hoped. Great glove for a great price. I've used these in rain and snow since I purchased them and they keep my hands warm and dry. Great dexterity and fitment. I got these gloves because I was tired of trying to use my bulky snowboarding gloves on cold rides. The fit between dedicated gloves like these and winter gloves is night and day. I can access all of the controls very easily and they slid on and off with ease. I have even used these gloves with an additional liner, and I could still access everything just fine. My one complaint is that these gloves did not keep my hands sweaty warm during a longer ride in cold weather. It was approximately 30° and after 45 minutes or so my fingers were really cold. I ordered a large, fits my hand pretty well. The glove is a little difficult to put on, the gauntlet does not go over my coat very well. OK as far as warmth, my fingers got a little cold at 20F with grip heaters. OK as far as value goes, does look like it may wear well. -m-2014 KAWASAKI Concours (ABS) ZG1400A--great price great value. Good quality. Highly recommended. Work well with heated grips. These gloves are warm and dry.I wore them in the rain between 45 and 50 degrees for most of a day and I had no problems. There may be better gloves on the market, but for the money these are a good buy. Not pricey and a decent value but don't expect these to last unitl you retire from riding. While build quality is less than stellar, they do keep hands very warm, perform as intended and a good bang-for-buck.